A removable stainless steel tea infuser specially designed to fit the Contigo Autoseal West Loop tumbler. Its fine etched holes ensure superior steeping and keep tea leaves or dust out of your brew. 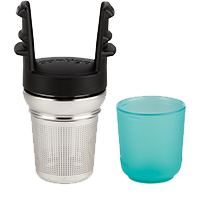 The infuser comes with 3 detachable parts: the stainless steel basket, the mug clip which securely snaps into any Contigo West Loop lid and the blue drip cup for easy transportation once steeping is complete.